There will come a time when our luck runs out but that time it seems is not tonight. I receive a text telling me that our seats for Mumbai are now RAC or “reservation against confirmation.” I have no idea what this means, so I call Mrugank to find out. My hearing is not the best and listening to his accent over a mobile phone with station announcements in the background is not helping. We first met Mrugank and his friend Shridhar four years ago while trekking in Nepal. We were playing cards at the high camp on the Annapurna circuit and they asked if they could join us. Say what you will of Facebook, but if anything it is an excellent way to stay in touch with people you meet while travelling. 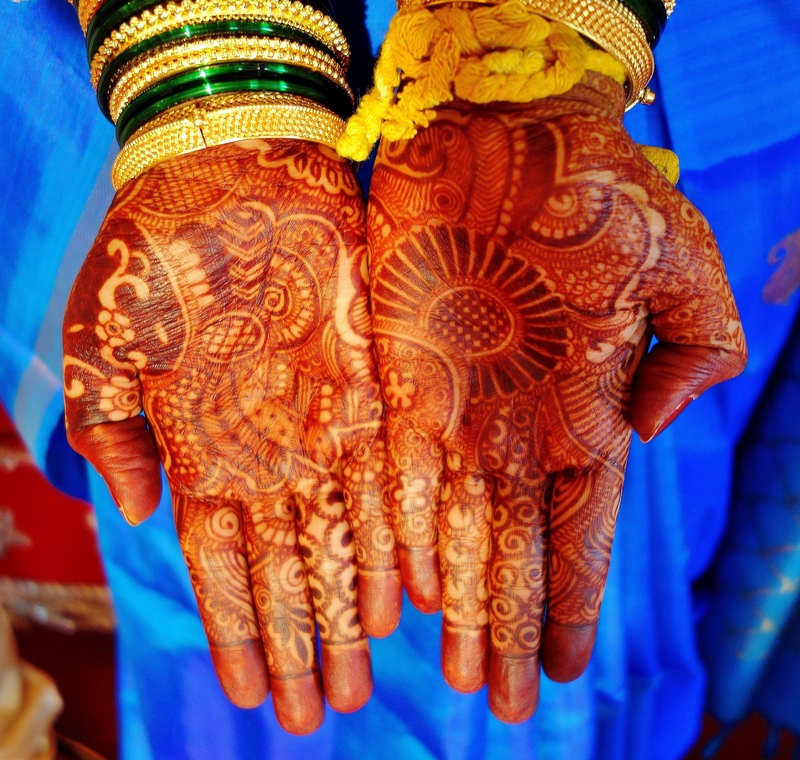 But we never expected to be invited to Shridhar’s wedding in Mumbai as a result. Mrugank explains that RAC means that one of our sleeping berths have been confirmed. It allows us to board the train and share the berth if necessary. It might also mean that at the last minute the other passengers on RAC will not turn up and then we get a berth each. The intricacies and classifications of India rail continue to confound me. Mrugank laughs over the phone. Yah it’s even difficult for us to understand don’t worry. I spot a couple of other foreigners sitting in the gloom at the end of the platform. Ryan is suffering from a bad stomach and looks grateful to be hidden in the darkness. He also happens to be my other RAC partner. Emma is paired up with an unseen Indian lady who is 65. We only know this because it’s on the seating chart stuck to the side of the carriage. Amy doesn’t have a berth confirmed at all. She asks what they should do. I tell them with full confidence to just get on the train and the conductor should be able to work something out. We pull out of Udaipur forty minutes before midnight with four people sharing 2 berths. The 65 year old Indian Lady never shows. It’s not long before the conductor turns up. Emma is in the clear and technically has her own berth, but in reality the situation is that we might have to share and let Amy and Ryan have his berth. Fortunately the conductor has room for Ryan in another berth and manages to get Amy a berth until seven in the morning. After this we shall need to share again. It’s a fair result given the predicament. I think about the station master in Jammu who lectured me in the power of positive thinking. I originally received his teachings with scepticism but I am beginning to think myself a convert now. I wake early the next morning. Sometime during the night and in between a fitful nights sleep we passed through the tropic of cancer. I could hear the train horn faint and constant in the distance. I flip the catch on the lock and open the door of our speeding train. I buy a masala chai for 7 INR and watch India flash by in the morning light. The first thing I notice is an increase in humidity and an abundance of Palm trees. The dawn fogs that had settled over Rajasthan are now gone. The sun is directly above us as we pull into Mumbai. We say goodbye to Ryan and Amy and look around for Mrugank. I am not entirely sure I will recognise him. I needn’t worry as a voice calls out my name. He is much taller than I remember and looks very different to his profile photo. This is a result of having to conform to his company’s personal appearance standards. The long hair and neat beard are gone, but he laughs this off. He drives us into an area of Mumbai known as Kemps corner. On the way we pass by an office block that is actually the private residence of the richest man in India. 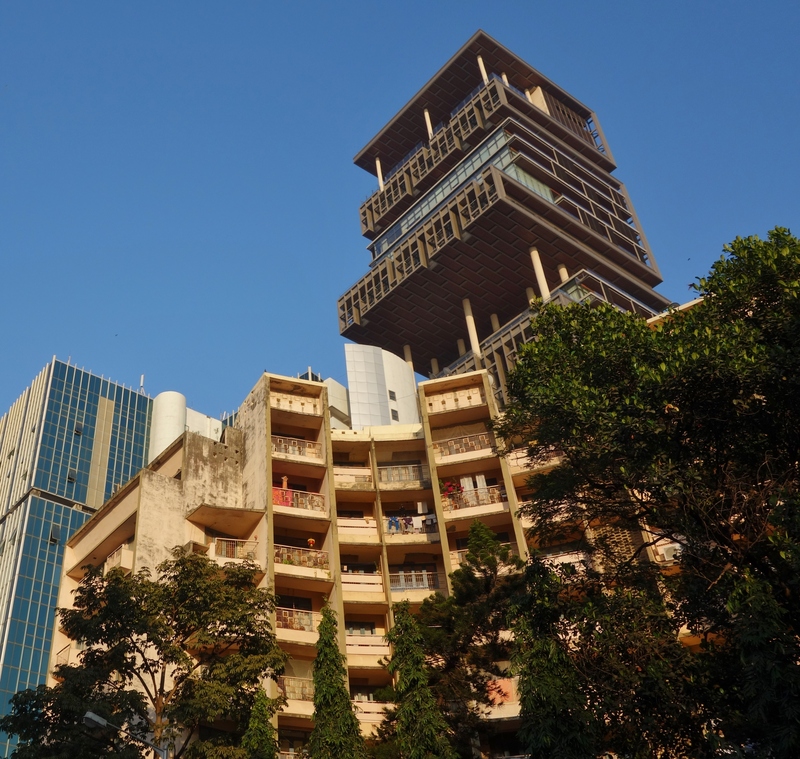 The building is over 30 stories tall and is the most expensive home in the world. 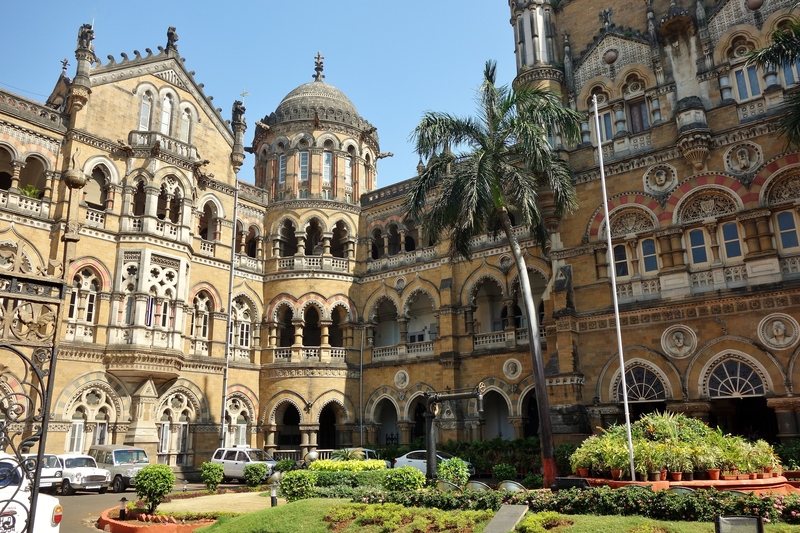 Possibly the greatest of these 19th century masterpieces is Victoria Rail Terminus. Built by the British in their own image, it was to be a symbol of the Empire for centuries to come. Now it sits among the palm trees and pepper vines like an aging expat overdressed and sweating in the tropics. Its legacy now belongs to the people of India. 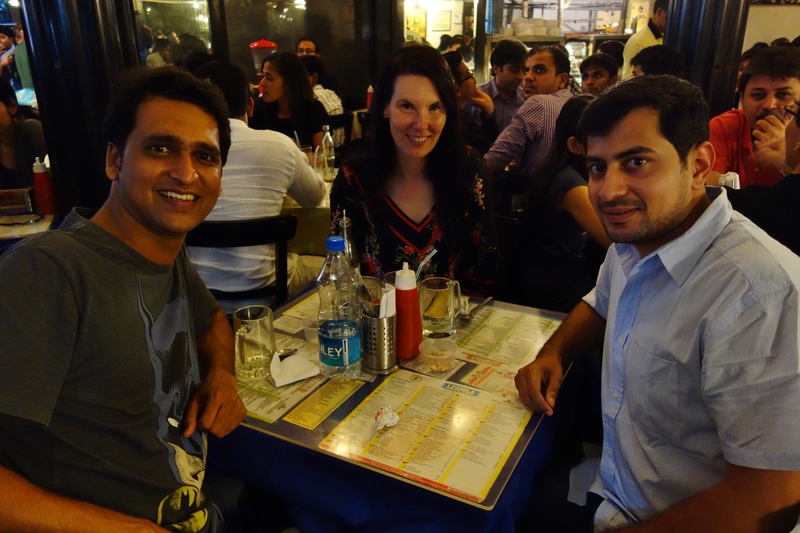 We meet up with Mrugank and Shridhar at Leopold’s for some reminiscing and beers. We muse over our time in Africa and back to our meeting in Nepal. More importantly we get a briefing on the wedding plans. Our current wardrobe is a little ragged and not really appropriate for weddings, but the guys have solved this problem and organised some traditional clothes for us both to wear… if we are game. 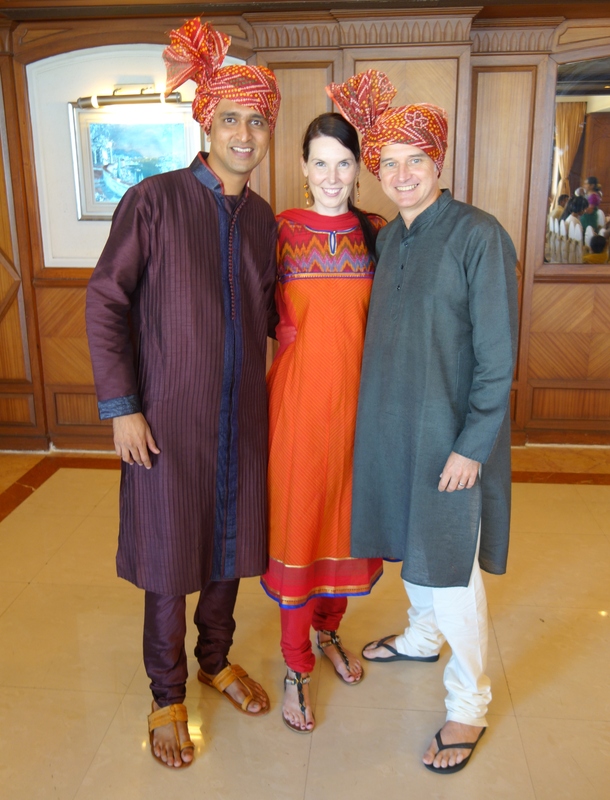 The chance to see a real Indian wedding in Bombay wearing local clothes is an exciting prospect. We visit a friend of Mrugank who has some dresses for Emma. Mrugank who is much taller than myself must have dug into some of his childhood wardrobe. Actually Indian clothes are very forgiving. The pants are meant to gather around the shins and the tunic hangs just a few inches lower than is normal. It’s the day before the wedding. I wake early as I do every morning in India. The daily ritual of sweeping, shouting and banging of just about everything echoes in the corridors. I am convinced that the Indians are incapable of quiet. This is of course an asset when it comes to festivals, parades and cultural ceremonies, but not when one is trying to sleep. Every morning at an ungodly hour we are woken by domestic tourists leaving their rooms and staff that shout instructions to each other down stone stairwells. I glance at the clock, its 6.00am. The barrage continues to around 7.30 when for some inexplicable and untimely reason it all becomes calm. In my opinion the worst offenders are young boys, who are making as much noise as possible before maturing into men and middle aged women, who seem to be making up for lost time and a childhood spent in relative silence. Whatever their motivations they are the principals of noise. 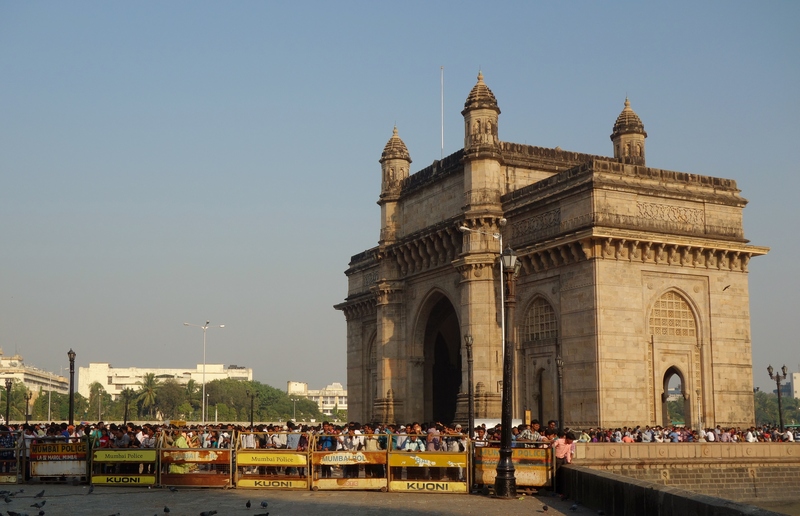 Ten Kilometres north of Colaba is a small area of Mumbai known as the Dharavi Slum. Perhaps unsurprisingly there is a question mark regarding slum tourism. In fact the word itself is a little distasteful when you think about it. However these slums are an important part of life in Mumbai and other parts of the world. Around 65% of Mumbai’s population live in slums and this certainly does come as a surprise. We are not overly keen on taking a tour. Personally I don’t like the idea of being led around in a group, especially if it makes locals feel awkward. We decide instead to compromise and visit on our own. 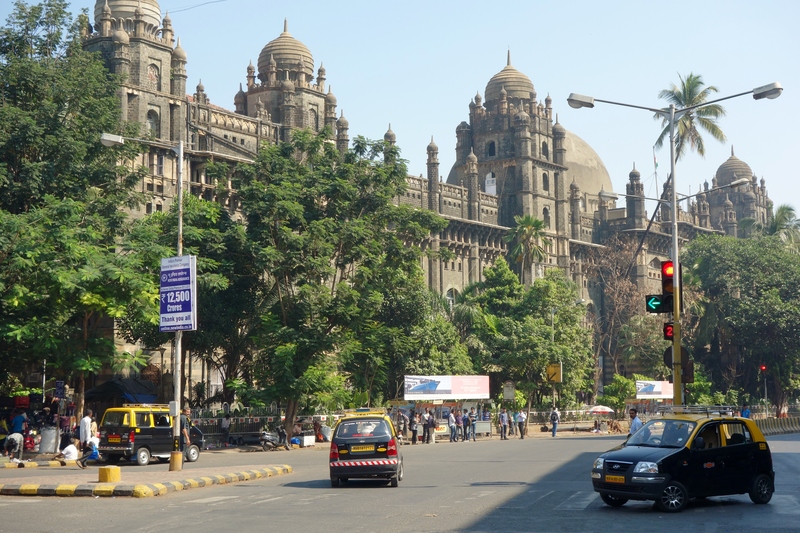 We walk to Churchgate station which is a pleasant kilometre stroll from Colaba. It’s midmorning when we arrive, the peak of traffic has passed but Churchgate is buzzing with activity by most cities standards. The ticket to Mahim which is the closest stop to Dharavi only cost 10 rupees. A rather fat train pulls into platforms 1 and 2. This is so people can exit on both sides. The interior of carriages appear partially stripped of seating allowing for wider doors and vital standing room. The metro trains in Mumbai have clearly evolved to cope with high volumes of passengers. Despite the vast interiors people still cling to the outside of the doors as we depart. It takes about 30 minutes to reach Mahim. I examine the rail map and each station carefully to make sure we don’t go too far. We exit to the left of the station turn right and walk about 500 meters up a non-descript street before climbing some stairs that take us over the tracks. From the bridge we can see the sprawling rusted roofs of Dharavi ahead. We descend the stairs and enter one of the world’s most famous slums. The main street dissecting Dharavi is not unlike most you would see in India. A tangle of rickshaws, cows and overloaded carts. Men shouting over the top of metal workers hammering tin and copper. Fruit and vegetable vendors display their goods on blue tarpaulin. There are even a few fish mongers with an audience of mangy cats gathered around their feet. The end of the road is bound by a filthy canal. The putrid water sits still and stagnant among rotting rubbish. It is by far the most disgusting body of water I have encountered. The smell forces us to retreat. We turn right and see a narrow dark entrance in between the buildings. A stream of people coming and going like ants into a nest. We follow them in through the narrow crack. The alley floor is covered with metal pipes, and dangling just above our heads are dozens of black electrical cables. It takes our eyes a few seconds to adjust to the darkness. The alley twist and turns, occasionally the walls of the buildings separate a little but mostly they press against each other like peak hour commuters forming a manmade cave. Despite the entanglement of infrastructure I am surprised to discover the alley is unexpectedly clean. We pass by houses that have trap doors open at the top of short staircases. The small rooms inside have tiled floors with painted walls and are far more liveable than I expected. Small children play on the stairs in clothes that have been washed and pressed. One young girl with yellow ribbons in her hair and a pristine white Shalwar Kameez greets us in perfect English and wave’s good bye as we pass. The locals seem a little surprised at first to see us alone and wandering in the shadowy corridors. Our passing causing only a small commotion of laugher. They seem happy to see us and some even bring their babies out to greet us. Our confidence grows and we delve deeper into the dark passages. What we are seeing is not a slum or at least not what I was ignorantly expecting a slum to be. This is a community, a well ordered society with family, friends and neighbours. People who work in white collared jobs choose to live here and I am beginning to see why. If anything I am the one who feels dirty and unwashed in back packer clothes. We emerge back into the light feeling a little hungry, but despite our new assessments we are not quite ready to tackle street samosas just yet. Instead we buy some bananas and oranges and eat them as we walk. I spot a barber shop oozing with old world charms. The timeworn chairs have cracked black upholstery and a squeaking pedal that adjusts the height. A small transistor radio is playing versus from the Koran. I stare at a scruffy reflection and ask for a full shave and a trim. The barber nods and forces my head back with firm hands. He sprays water of an unknown source over my face. I think about the dirty canal and press my lips together tightly. He then squeezes some cream in a stone bowl and begins stirring it into a lather. The foam is applied with a thick brush and dabbed into all my facial recesses. I begin to wonder if he is going to shave the inside of my nostrils. Time seems to be of no concern as the application of foam to face lasts over ten minutes. He reaches for the razor and proudly unwraps a new blade making sure I am aware of its use. He presses a thumb to my temple and squeezes pulling the cheek tight. The razor descends with a tiny crackle leaving a trail or perfectly smooth skin. It’s a wonderful sensation. He wipes the mixture of cream and whiskers on a towel before proceeding. Such clean strokes, you can hear hundreds of whiskers being severed, the thin blade of metal against your skin, only a few degrees of angle preventing a blood bath. He completes the cheeks and neck leaving only the moustache. He asks again if I would like this left, almost resolute not to remove what is a national symbol in this country. I nod and he pinches my lips together, I can feel his thumb pressing into my mouth as he applies delicate short strokes to my upper lip. Outside a small group of men have gathered at the entrance. They watch with great interest a foreigner being shaved, but I think even more entertaining and unusual is the presence of a woman sitting in barber shop. We leave the slum with very different impressions. In the three hours we spend here not one person from the oldest man to the youngest child ever asked us for anything. No money, no pens, no sweets. Just warm smiles and kind greetings. This is a wonderful place, a place that has spirit and I do not mean to say this in a condescending way at all. It’s simply a good place to live. Perhaps other slums are different and three hours by no means makes you an expert, but from what we have seen Dharavi appears in no way a slum, a place without purpose or hope. To think of it this way would be completely wrong. The day of the wedding starts early but not so much as it does for the bride and groom. They were both up at 3am receiving special blessings. We enter a hall that has been personally prepared for the service. On a stage is a small gazebo that has been bound with flowers. The bride and groom are wearing elaborate and colourful garments. Their faces are surrounded by strings of pearls. A few seats are occupied by only the eldest members of the congregation, everyone else is standing around and mingling. The order of ceremony seems very different to that we experience in the west. It appears that here the couple arrive first and wait for their guests. Just to add to the confusion it seems despite the activity on stage people do not take their seats but just stand around like we do once the ceremony is over, talking and taking pictures. Mrugank explains that they are going through some blessings by a Brahman priest before the main ceremony begins. I am escorted to a seat where men are tying the heads of male guests in a turban. I bite on one end of the cloth while he pulls tight and embalms my head in layers of vibrant cotton. The transition from blessings to ceremony is not totally clear to me. No one ever really takes their seats. Then the wedding vows start. I can only assume that they must be of a steamy nature. The audience are in raptures with each line spoken. A series of unknown foreign promises met with excited gasps, applause and laughter. Then finally a part that is familiar, the throwing of rice but even this is done with extreme enthusiasm. They are both pelted over and over occasionally having to take cover. Like most things I experience in India the ceremony feels chaotic and beautiful. Far more open and less stiff than our western ceremonies. The partying begins from the moment you enter the room. There are no clasped hands and hushed whispers. People are free to move around and come and go as they please. 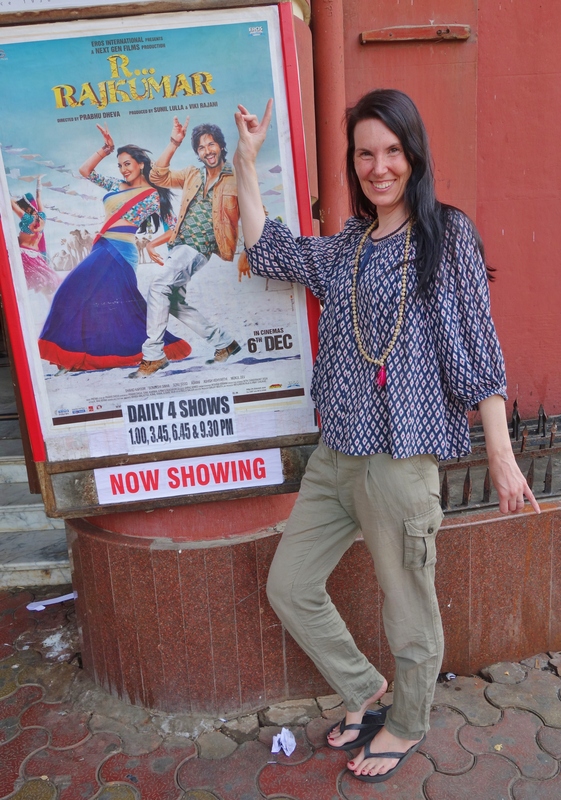 We have had a wonderful time in Mumbai or Bombay as the locals still call it. We both feel very grateful to have been shown around by Mrugank and been able to attend the wedding of Sneha and Shridhar. When we started our trip we had no way of knowing 10 months later we would be at an Indian wedding. It’s these unexpected experiences that make travelling this way so exciting. 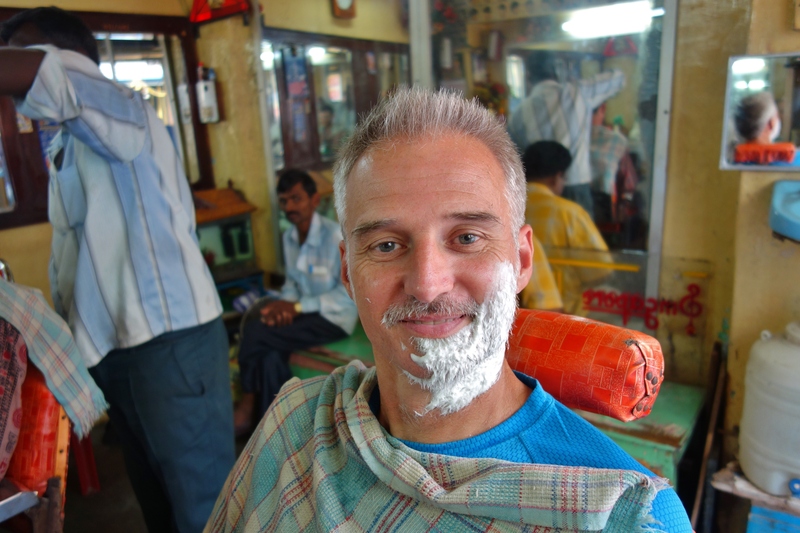 Our time in Mumbai is now over and we must continue south to the beaches of Goa and onto Kerala and Tamil Nadu.